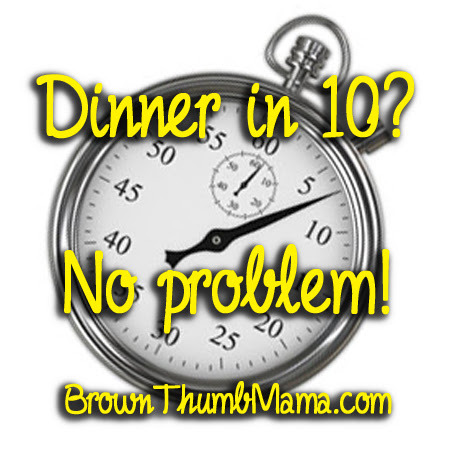 You are here: Home / Kitchen Tips / Dinner in 10? No problem! 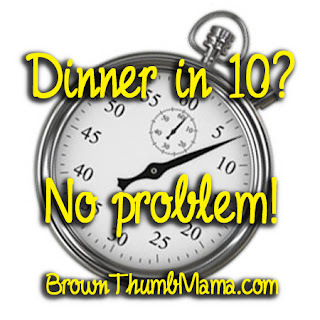 Dinner in 10? No problem! The kids are crabbing at each other because they’re starving. You’re late getting home, and nothing is defrosted. Hubby brings home 3 friends for dinner without warning. That new recipe that “looked so good in the cookbook” was a disaster. It’s 108 degrees outside and you are NOT going to turn on the oven or the stove. So how do you make dinner magically appear when all the forces of the universe are working against you? Watch for bone-in, skin-on chicken breasts to go on sale. Around here, they can be as low as 99c a pound. Spend whatever your budget will allow–in my case, it was $15. When you get home, rinse the chicken and put it on a cookie sheet skin side up. I had so much chicken that I had to cram two trays full. 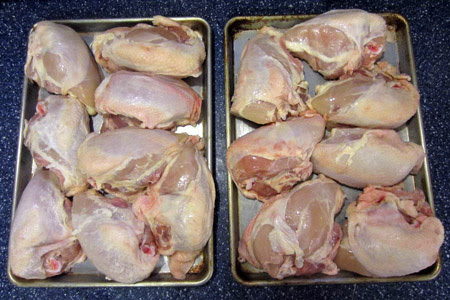 If you have less chicken, spread them out a bit so the heat will circulate better. No need to add any seasonings or oil. Bake the chicken in a 350 degree oven, uncovered, for about 35 minutes or until the internal temperature reaches 160 degrees. My chicken was so crowded that I had to cook it for an additional 10 minutes. Let the chicken cool, then pull off and discard the skin. Now you want to pick every morsel of meat off the bones, and shred it into bite-sized bits as you go. This is a great job to have the minions kids help with. Keep going and going until you have all the meat off the bones. 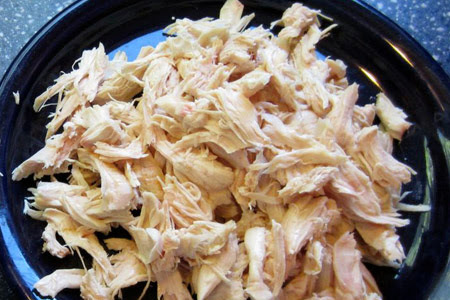 Save the bones to make chicken stock (an excellent recipe is in Better Than a Box). Then package up the shredded meat into portions that work for your family–I made 2-cup packages. Stash these in the freezer and you’re ready to make dinner in a flash. What else do you make with shredded chicken? "What happened to your onions?" 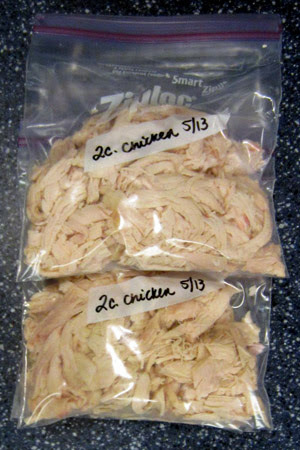 Having cooked chicken in the freezer is a lifesaver sometimes. Thanks so much for all the variation ideas and recipes!! (I’m tweeting and pinning) Have a lovely day. I posted a DELICIOUS DELICIOUS recipe on my blog yesterday – middle eastern turkey burgers! Those puppies are done in 10 minutes, no problem! 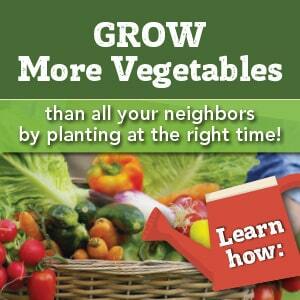 a great tip! love having cooked chicken in the freezer. Do you thaw it after it is in the freezer or put it into dishes that are already cooking on the stovetop? You can use it either way! It freezes into a big clump, so you’d want to thaw before using in quesadillas, for example. I make chicken pot pie, or a creamy chicken and rice dinner. I make shredded chicken sandwiches or chicken burritos with rice and sometimes beans. Chicken salad is good fro lunch. BBQ pizza or chicken hot pockets. Chicken is versatile you can make many meals with frozen cooked chicken on hand. Great idea! How about, instead of cooking it in the oven, adding it to a big pot of water with onions, carrots, celery, and to forth to make stock – if you take it out after an hour, it’s cooked. That way you can remove the meat, throw the bones and skin back in and turn the broth into stock at the same time – save resources, time, and delicious cooking juices!